Second-time Speaker of the House Nancy Pelosi (D., Calif.) united almost the entire Democratic House caucus behind her in Thursday's leadership vote, even though several of her supporters had previously promised not to vote for her. Eight Democrats who signed a letter opposing Pelosi after the midterm elections ultimately came around to vote for her: Reps. Tim Ryan (Ohio), Steven Lynch (Mass. ), Bill Foster (Ill.), Ed Perlmutter (Colo.), Linda Sanchez (Calif.), Seth Moulton (Mass. ), Brian Higgins (N.Y.), and Filemon Vela (Texas). Pelosi brought them all into the fold after an aggressive intraparty campaign in November and December. In addition, Rep. Andy Kim (N.J.) was opposed to Pelosi right up until Thursday when he reversed course and voted in favor of her. 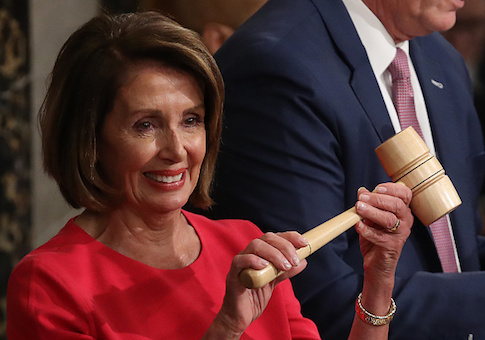 A handful of other Democrats had said before they would not support Pelosi but appeared to quietly renege in recent weeks: Reps. Rashida Tlaib (Minn.), Gil Cisneros (Calif.), Jahana Hayes (Conn.), and Dean Phillips (Minn.). Dozens of Democrats who voted for Pelosi Thursday, such as Rep. Alexandria Ocasio-Cortez, had dodged questions about Pelosi or called for "new leadership" during their campaigns but then refrained from backing another candidate for speaker. They eventually joined the majority backing Pelosi when no other candidates threw their hat in the ring. Rep. Marcia Fudge (Ohio) floated the idea of running against Pelosi but then got behind her. Meanwhile, 15 Democrats voted for another Democrat not running for the speakership or voted "present." This entry was posted in Politics and tagged Democratic Party, Nancy Pelosi. Bookmark the permalink.